Clean Carfax. The 2014 Nissan Pathfinder has upscale cabin materials, a spacious third row, and good fuel-efficiency for the class. The 2014 Pathfinder comes with a 3.5-liter V6 engine paired to a continuously variable automatic transmission (CVT). Both front-wheel drive and all-wheel drive are available. The Pathfinder is quite efficient for its size; its fuel economy rating of 20 mpg in the city and 26 mpg on the highway is one of the highest in the class. Two of the best aspects of the 2014 Pathfinder are its generous passenger space and high-quality cabin materials. Soft touch points are plentiful in even the base Pathfinder S, but if you want to feel more like you're riding in an Infiniti (Nissan's luxury brand), uplevel trims like the Platinum and Platinum Premium add an extra dose of elegance. The 2014 Pathfinder is also one of the rare 3-row SUVs that can comfortably seat adults in the back for short trips, thanks to its sliding second-row seats and generous rear headroom. The Pathfinder has room for up to seven people. Its LATCH child-seat system includes lower anchors on the outboard seats in the second row, upper tether anchors all the way across this row, and one additional tether anchor in the third row. The Pathfinder's cargo space is below average, and its standard features list is skimpy. Every model comes with tri-zone automatic climate control and an auxiliary port, which are typical for this class. Still, the similarly priced Mazda CX-9, Chevrolet Traverse, and Honda Pilot come with Bluetooth and a USB port. 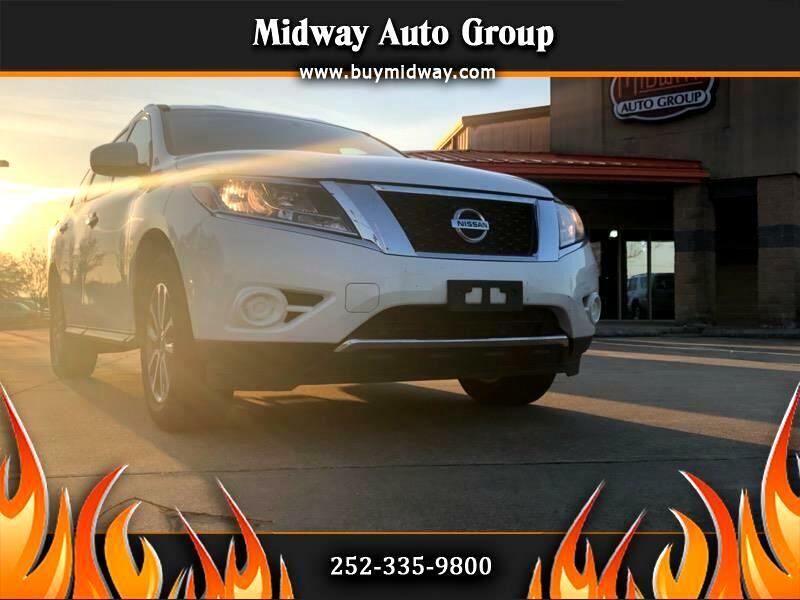 Not every Pathfinder is barren, though; there are plenty of features available, including a rear-seat entertainment system, rear parking sensors, and a 13-speaker Bose audio system. The navigation system and a 360-degree camera are both standouts of the Pathfinder's available technology. The average price of a used 2014 Nissan Pathfinder is about $17,500. Pricing tops out around $26,200. Remember that a used car’s price tag varies based on vehicle mileage, condition, trim level, and location Crash test results for the 2014 Pathfinder are very good. It has a five-star overall rating from the National Highway Traffic Safety Administration (though it doesn't earn five stars in every NHTSA test). The Insurance Institute for Highway Safety didn't conduct every crash test on the 2014 Pathfinder, but it awarded the SUV a first-place Good rating for the three tests it did perform. No driver assistance features come standard in the 2014 Pathfinder. In comparison, rivals like the Chevrolet Traverse and Honda Pilot include a rearview camera in every model. Among the available safety features for the Pathfinder are a rearview camera and rear parking sensors, as well as the highly praised Around View Monitor, which offers a 360-degree view around the vehicle.